The new Classic T features a 60's C vintage standard neck profile. The Classic T retains many of the original specifications of the Classic T Pro including the SSCII hum canceling system and stainless steel frets. The Wilkinson compensated 3-saddle bridge provides classic 3-saddle tone with superior intonation. One of a five-piece limited run! The combination of Redwood and Walnut always brings a smile to players looking for a guitar featuring balance, clarity, and a warm, "woody" tonal signature. What does a leaner body depth add to the mix? Turn an imaginary "presence" knob up a couple notches, and you'll get the idea. The Redhead LE introduces several new features, including a Celtic-inspired "Braided" rosette and silver fretboard inlays. Bourgeois' classic Snakehead headstock and Cocobolo bindings complete a simple but elegant package, at an attractive price point. Individually hand-built using traditional materials & "Old World" craftsmanship. Solid Spruce Top, Solid Maple back & sides with Ebony fingerboard & adjustable ebony bridge. A-style body with F-holes for liquid tones and excellent projection. The new Classic S features a new 60’s C vintage standard neck profile with indian rosewood or maple fingerboard and V60LP single coils. The Classic S retains many of the original specifications of the Classic Pro including the SSCII hum cancelling system and stainless steel frets. Proprietary Suhr locking tuners and the Gotoh 510 tremolo provides superior tuning stability. 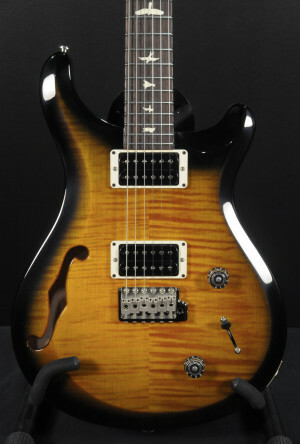 Featuring a very cool custom color, Amber Smokeburst. The S2 Custom 22 is a classic workhorse guitar. Known for its exceptional clarity and warm midrange, the S2 Custom 22 Semi-Hollow has been updated here with a semi-hollow single f-hole mahogany/maple body, giving this vintage-inspired guitar a classic look and outstanding resonance. Appointments include the PRS patented molded tremolo, 85/15 "S" treble and bass pickups, and a push/pull coil tap on the tone control for versatile, alive vintage tone. Twenty years ago Jean Larrivee found a log of Koa that he said yielded the finest, most highly figured Koa he had ever seen and would likely ever find again. Jean may be right, in the all the years we've been in business we've never seen any other Koa that comes close to the depth of figure and color that log produced. Larrivee made a batch of Koa guitars from that log for the 2000 NAMM show. Built at the end of 1999, this D10KK was one of the guitars shown at the 2000 NAMM Show. It is drop dead gorgeous. It's so figured that you'd think it was a 5A grade flamed maple stained to look like Koa because Koa just never looks like this. We bought this guitar and a handful of other Koa Larrivee guitars from that show. It was purchased from a local collector, and from the looks of it, it was hardly played. It's in near mint (9.5) condition. Aside from its amazing looks it also has amazing tone and sustain! The longer you let it sustain, the more overtones you hear, producing an incredible pallet of colors. This is a loud guitar with a BIG voice! Strum an open chord and you'll feel the neck resonate in the palm of your hand and the body of the guitar will rattle your upper torso. The sound just wants to jump across the room. Deep warm lows, sparkly highs. Punchy mid range. It's one of, if not the best sounding Koa guitar we've heard. This is a rare instrument, and a great one. The Presentation idea goes back to the late 1800's when banjo and guitar manufacturers would make the best instruments they could to be displayed at World's Fairs, and other venues, to show the public the quality of their work. This is Larrivee is their finest. This fantastic sounding Thomas Bazzolo nylon-string model was built in the spring of 2001. Thomas Bazzolo was a well respected guitar builder in the Boston area and apprenticed under famed luthier, Frank Haselbacher. Professional, all solid wood construction. 650mm scale. Top of the line Gilbert tuning machines. Western Cedar top, with Indian Rosewood back and sides. Honduras mahogany neck with Ebony fingerboard. Indian Rosewood bridge, body binding, headstock backstrip, and headstock overlay. Hand finished with an oil varnish. In excellent condition, showing only the slightest hints of cosmetic wear. It has had no modifications or repairs. This responsive instrument produces the rich, full sound that one would expect from a professional grade classical guitar.